During the half century when there were no formal diplomatic relations between our countries, environmental collaboration has been held up as one of the best examples of collaboration between Cuba and the U.S. Ocean Doctor has been part of these efforts for more than 15 years. Scientific collaboration — especially marine research and conservation efforts — has been credited with being instrumental in helping to restore diplomatic relations through its strong example of collaboration and building a foundation of enduring trust and friendship during the years without diplomatic relations. “More broadly, we’re moving ahead with partnerships in health, science, and the environment… Our governments will also work to protect the beautiful waters of this region that we share. The first formal agreement between Cuba and the U.S. came this past November — an agreement on the environment. (You can find full text of agreement on the State Department web site here). A second agreement focused on marine conservation, including a “sister sanctuary” program between our countries, was also announced in November 2015. Ocean Doctor, along with colleagues including Environmental Defense Fund, is helping to lead efforts between the U.S. and Cuban governments to implement the agreement on the environment. 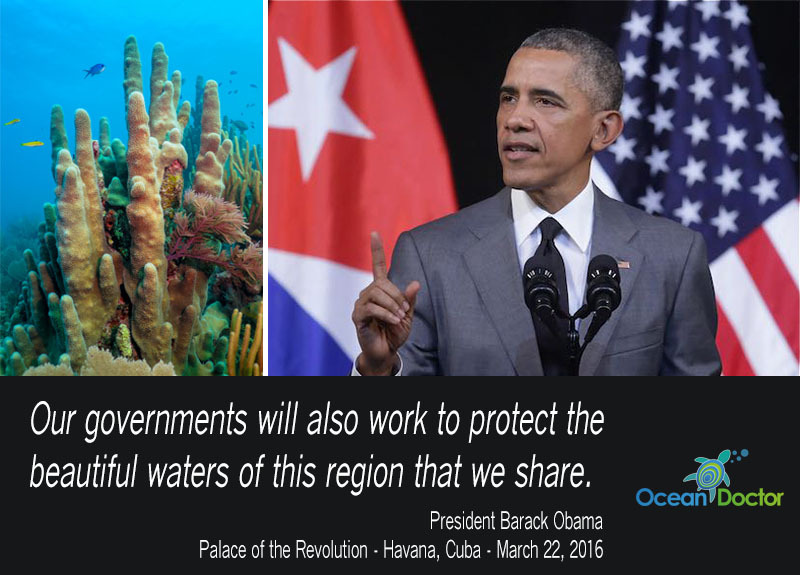 In his remarks to the Cuban people on March 22nd, 2016, President Barack Obama — the first U.S. president to visit Cuba in nearly 80 years — cited the environment, including marine conservation and climate change, as key areas for collaboration during his speech at Havana’s Palace of the Revolution (right). As a new chapter opens between the U.S. and Cuba, we fervently support strong government-to-government collaboration on the environment. Ironically, the very political changes that have enabled such collaboration between our governments are also creating a “tsunami norteamericano,” as our Cuban colleagues call it, as thousands of eager visitors from the U.S. flood into Cuba, triggering an unprecedented level of tourist development in the country. Strong collaboration by both governmental and non-governmental organizations, will be essential to ensure that Cuba can avoid the mistakes made by many other Caribbean islands and chart a sustainable path with its new friend to the north.